When you set foot in St Mark’s Square (Piazza San Marco) in Venice for the first time, you’ll probably be overwhelmed by all the magnificence surrounding you – Doge’s Palace, the Basilica, the Bell Tower… So you might accidentally walk between the two granite columns at the end of the square (the so-called Piazzetta, or small square) – something locals would never do because of a centuries-old superstition. The columns were brought from Constantinople in the 12th century. 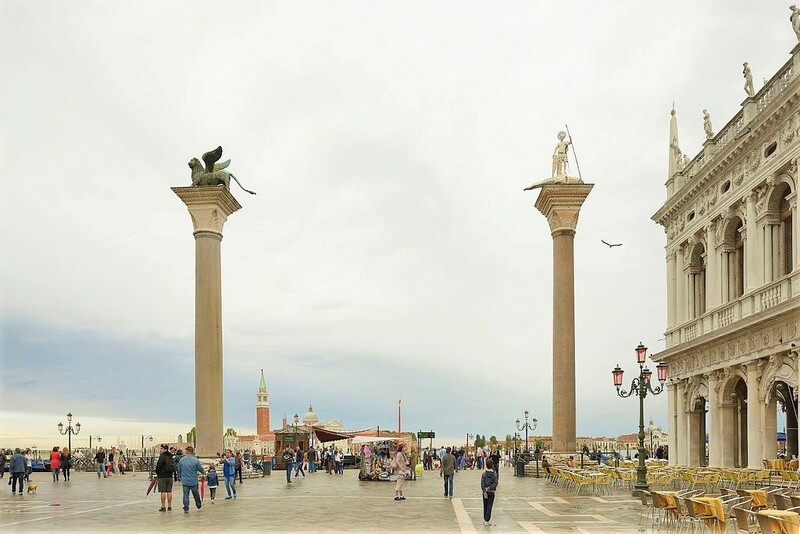 If you can imagine what Venice used to look like then, you will easily be able to picture the columns being the main entrance to St Mark’s Square for everyone arriving from the sea. The Byzantine emperor gave them to the Venetians as thanks for their help in the Second Crusade. One of the columns has a winged lion (the symbol of the Venetian Republic) on top, and the other features the figure of St Theodore (the other patron saint of Venice) poking a dragon. You might not know that the original gift comprised three columns. Although it survived the whole trip from Constantinople, the third column rolled off the boat at the end of the trip while being transported to land in Venice Lagoon. The muddy lagoon seems to have immediately swallowed the column. A special sea master was immediately assigned to search for it for almost 20 years (!!! ), but all that effort was in vain. In 2016, researchers embarked on a new probe of the lagoon in the hope of rescuing the column from almost a thousand years of oblivion and returning it to its rightful place between the two others. 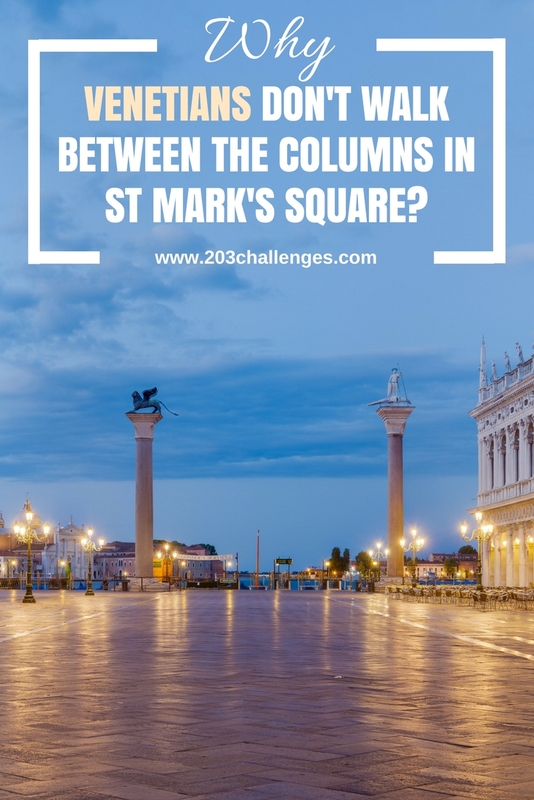 The two other columns had to be erected in the square, but the task turned out to be more challenging than anticipated. It took several decades before the feat was achieved by local engineer Niccolo Barattieri, who asked in return for the right to place gambling tables between the columns (gambling was completely illegal at the time). Later the area was covered in wooden stalls, and in the 18th century the authorities decided to change the ambiance of the area entirely by turning it into a public execution spot. This grim period in the square’s history is the reason for the local superstition of not passing between the pillars. P.S. 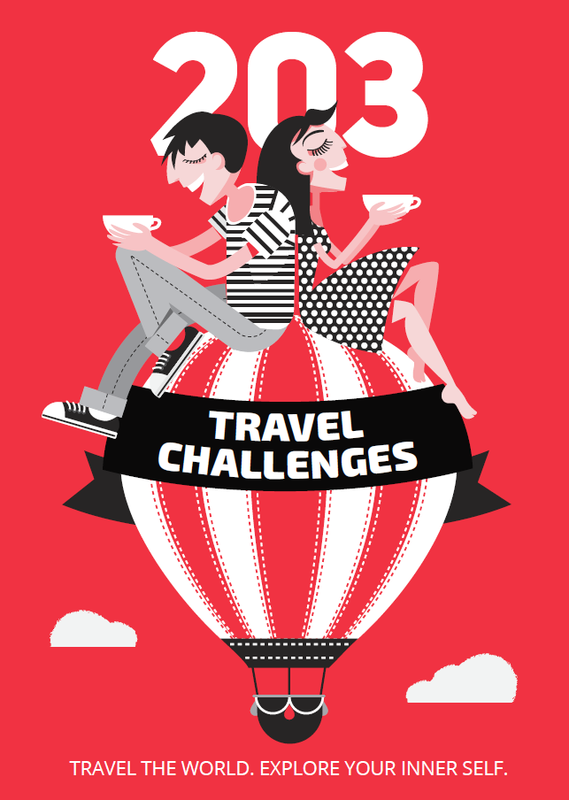 And don’t forget – while in Venice, drink wine in the shade, like the locals do.